High-resolution scanned page images of the memo are now available. The scan was made in June 2006. These are 200 dpi scans too large to display in full on most screens, so you will probably want to use your browser's "save to disk" feature. 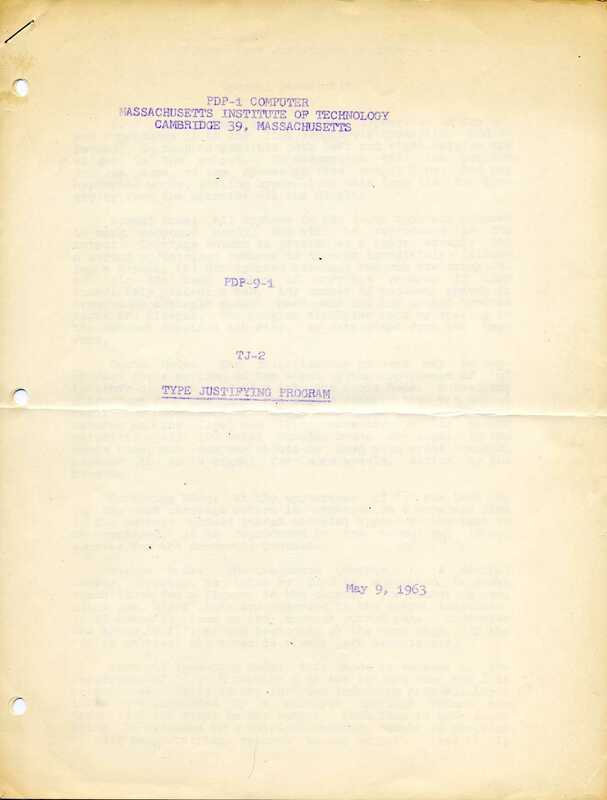 This is an annotated copy of a 1963 memo describing TJ-2. TJ stood for "Type Justifier." TJ-2 ran on a Digital PDP-1 computer with 4096 eighteen-bit words of core memory with a 5 microsecond cycle time; in modern terms, 9K of RAM and a 200 KHz (kilohertz, not megahertz) clock. Pete Samson demonstrated TJ-2 to me and gave me the impression he was the author; the TJ-2 memo does not credit any individuals. 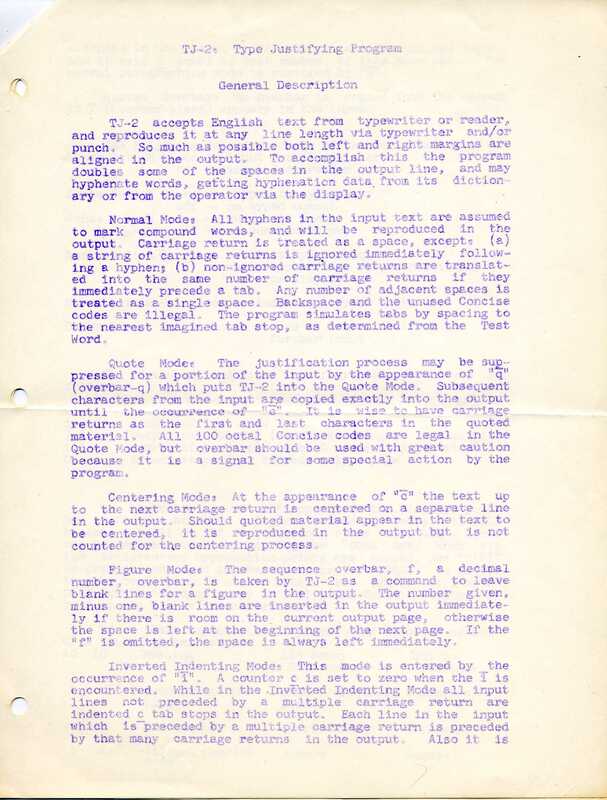 This document uses the Netscape text color attribute TEXT="#400060" to suggest the light purplish color of the actual memo, which was reproduced by means of a spirit duplicator. Numbers in square brackets in the right margin refer my own notes, which follow. Normal text; text that is underlined in the original. would print as an overbar directly above the X, like the "macron" diacritical mark. Whereever you see this sequence it should be understood that in the original the overbar is printed directly above the character that here is shown as following it. ary or from the operator via the display. counted for the centering process. "f" is omitted, the space is always left immediately. normal paragraphing mode is restored by "¯n". if ¯/ (overbar-slash) appears in the input. 0        if on, stop after current output page. the  satisfactory hyphenation-points are  marked, pen "SAVE"
TJ-2 starts with a blank dictionary. NOTES: Following notes are copyright 1993, 1997 by Daniel P. B. Smith. All rights reserved. Permission granted for Internet distribution and nonprofit use. Was TJ-2 a word processor? any kind of text attributes or text emphasis (not even underlining). The hyphenation feature was surprisingly sophisticated and used a sort of graphic user interface. Notice that none of the following terms are used anywhere in the memo: application, document, editor, font, format, software, text, word processor, word wrap. (I first encountered the term "word processing" in an IBM advertisement of the mid-seventies, where the term was understood to encompass manual typewriters and dictating machines as well as magnetic-card Selectrics). The general writing style of the memo is similar to that, e.g. of the Digital PDP-1 Handbook. The capitalization of terms such as Test Word, Indented Text Mode, etc. 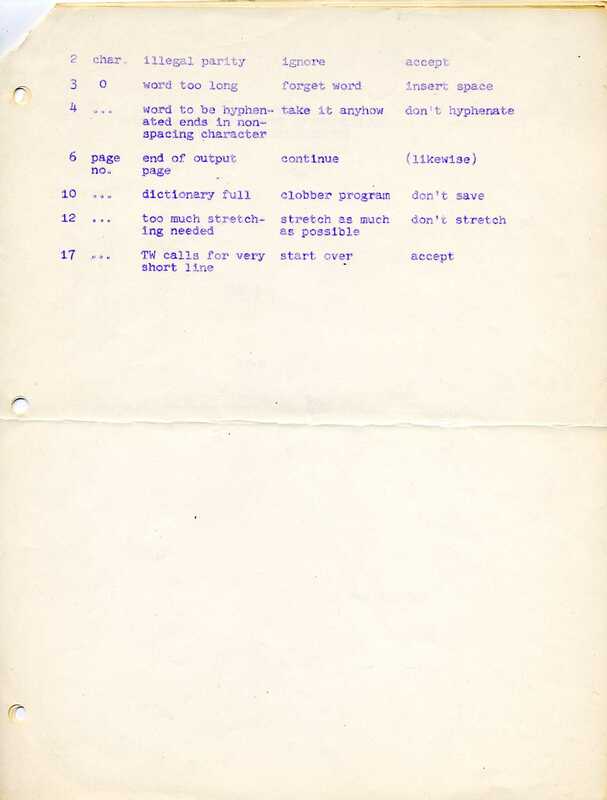 is similar to that in the PDP-1 Handbook, which contains phrases such as "the Light Pen status bit is set to one," "the contents of the extended Program Counter in bits 2 through 17," etc. No name is credited as either author or programmer. The program was demonstrated to me by Pete Samson. It was my impression that he wrote it but others may have contributed. I've tried to duplicate the precise locations at which TJ-2 placed spaces, hyphens, etc. "Typewriter:" the PDP-1 console typewriter. This was an IBM electric typewriter to which a company called Soroban Engineering had added switches and solenoids capable of sensing and initiating keystrokes. This IBM typewriter was a traditional design with typewriter-style typebars (not a "golfball" Selectric). As was customary in typewriters, each typebar carried a pair of characters, one uppercase and one lowercase. The shift key raised or lowered the entire heavy type basket, selecting which of the two characters struck the ribbon. The Soroban mechanism was quite unreliable, and, in particular, often missed a case shift. However, it provided what in eighties terminology would have been called "true letter quality" printing. An additional feature of this unit was a two-color red-and-black ribbon. The PDP-1 debugger, for example, printed user commands in black and debugger responses in red. "Reader:" high-speed 400 "line"/second photoelectric punched paper-tape reader. "Concise code:" the character set used internally on the PDP-1, a six-bit code formed by truncating the full "FIO-DEC" codes, which included a parity bit. 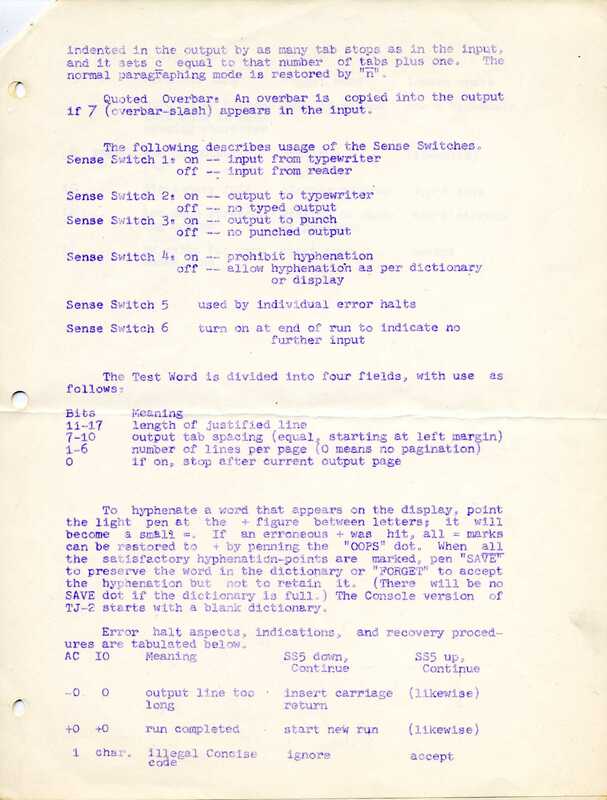 A portion of the table is reproduced here; notice that every code has both a "lower" and "upper" character; notice too the upper-case mappings of the numerals. Letters preceded by a overbar here, e.g. ¯q, appear in the original with an overbar above them. A nonspacing (dead key) overbar was part of the PDP-1 character set and frequently used as a syntactic convention to identify commands. "Light pen:" a pointing device. It could not sense position, like a mouse. It merely signaled the presence of a point of light directly under it. Somewhat complicated strategies were needed to acquire and track the pen. Additional key phrases: computer history; computer folklore; computer nostalgia; history of computing; DEC; Digital Equipment Corporation; TMRC.